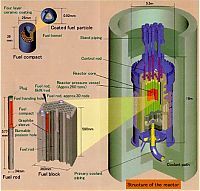 PWRs use nuclear-fission to heat water under pressure within the reactor. This water is then circulated through a heat exchanger (called a "steam generator") where steam is produced to drive an electric generator. The water used as a coolant in the reactor and the water used to provide steam to the electric turbines exist in separate closed loops that involve no substantial discharges to the environment. Of the 104 fully licensed reactors in the United States, 69 are PWRs. Westinghouse, Babcock and Wilcox, and Combustion Engineering designed the designed the nuclear steam supply systems (NSSS) for these reactors. After these reactors were built, Westinghouse and Combustion Engineering nuclear assets were combined with British Nuclear Fuels Limited to form Westinghouse BNFL. The French-German owned firm Framatome ANP has acquired many of Babcock and Wilcox's nuclear technology rights, though portions of the original Babcock and Wilcox firm still exist and possess some nuclear technology rights as well. 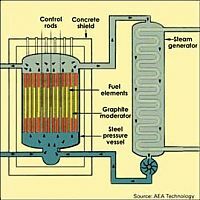 Other major makers of PWR reactors, including Framatome ANP, Mitsubishi, and Russia�s Atomstroyexport, have not yet sold their reactors in the U.S.
BWRs allow fission-based heat from the reactor core to boil the reactor�s coolant water into the steam that is used to generate electricity. General Electric built all boiling water reactors now operational in the United States. Framatome ANP and Westinghouse BNFL have each designed BWRs. These have not yet been sold in the United States. PHWRs have been promoted primarily in Canada and India, with additional commercial reactors operating in South Korea, China, Romania, Pakistan, and Argentina. Canadian-designed PHWRs are often called "CANDU" reactors.9 Siemens, ABB (now part of Westinghouse), and Indian firms have also built commercial PHWR reactors. Commercial heavy water reactors now in operation use heavy water as moderators and coolants. No successful effort has been made to license PHWRs in the United States. PHWRs have proven to be popular in several countries because they use less expensive natural (not enriched) uranium fuels and can be built and operated at competitive costs. PHWRs have often been preferred by nations wishing to develop an indigenous fuel cycle without expensive enrichment facilities. The continuous process of refueling PHWRs have raised some proliferation concerns as has the high Pu-239 content of the spent fuel. PHWRs, like most reactors, can use fuels other than uranium. Particular interest has been shown in thorium-based fuel cycles. Perhaps the most famous example was the Fort Saint Vrain reactor that operated between 1974 and 1989. It was a high temperature gas-cooled reactor or HTGR. Other HTGRs operated elsewhere, notably in Germany. HTGRs, of which there are many sub-categories, continue to stimulate commercial interest. HTGR designs are promoted by firms in China, South Africa, the United States, the Netherlands, and France. There is some interest in building commercial HTGRs in several nations including South Africa and China. Small research prototypes already exist in Japan and China. HTGRs use a gas- helium has been preferred- to generate electricity. In some cases the turbine is run directly by the gas, in other cases steam or alternative hot gases such as nitrogen are produced in a heat exchanger to generate the power. HTGRs are distinguished from other gas-cooled reactors by the higher temperatures attained within the reactor. Such higher temperatures might permit the reactor to be used as an industrial heat source in addition to generating electricity. This improves HTGR�s suitability for commercial hydrogen production. Advocates of HTGR designs hold that HTGRs have high safety, low costs, and a potential to supply power to smaller markets than do LWRs. HTGRs also are reputed to adapt better to changing load requirements of electricity markets than LWRs. 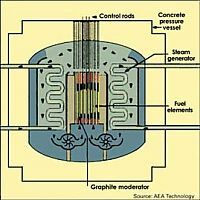 The term gas-cooled reactor (GCR) can be used ambiguously. HTGRs, for example, are a subset of GCRs that operate at higher temperatures. As used here, GCRs include "Magnox" reactors designed and built in the United Kingdom since the 1950s and the derivative, advanced gas-cooled reactor (AGR), also operated in the United Kingdom. Similar reactors had been built and operated in France, Sweden, and Japan but have since closed. No GCR design, as defined here, has operated commercially in the United States. Commercial GCRs11 in the United Kingdom have operated longer than any category of commercial reactors anywhere else in the world. Like the PHWRs, the original GCR designs use natural uranium fuels, though newer designs (AGRs) use slightly enriched fuels and are not confined to uranium fuels.